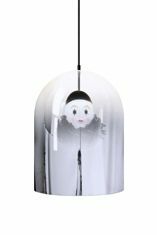 The iconic 17th Century Italian clown Pierrot is presented within a mirrored glass dome. The iconic 17th Century Italian clown Pierrot is presented within a mirrored glass dome. When lit up the domed mirrored glass disperses the light and reveals the subject. This playful lamp take an icon of the past and give it an unexpected modern twist. Here Pierrot is wearing his typical black hat, white face paint and frilled collar, encased in glass as if a museum relic. Designed by Young & Battaglia.